This will be a short post because I have a lot to do this morning. My life is continuing as usual, see? The yellow dot shows approximately where Fukushima Prefecture is. This is where the nuclear power plants are that everyone is so worried about. 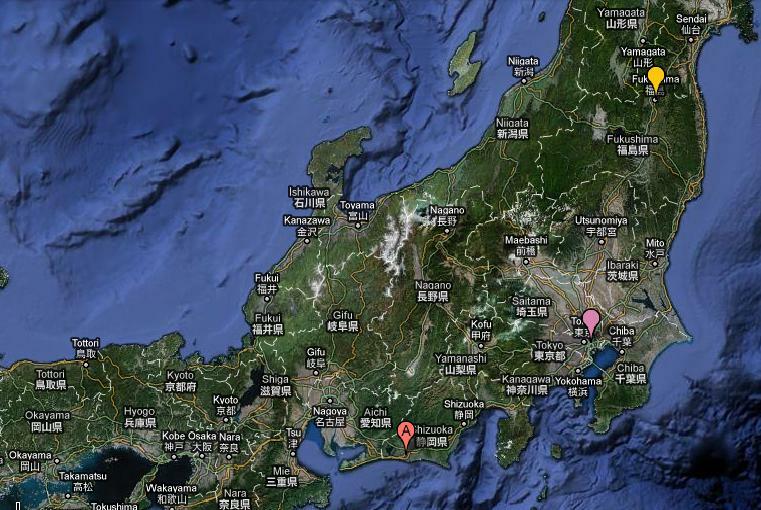 The pink dot marks Tokyo, and the dot that says “A” shows Ali (me). You will see many pictures of Japanese wearing masks and the captions will tell you it is because of the “risk of nuclear fallout”. Right now it is hayfever season in Japan and a really large number of people are wearing masks for that reason. Also, the Japanese generally wear masks at the first sign that they have a cold, that someone else has a cold, or just for general “protection”. During the bird flu and swine flu scares people wore masks more than ever. This is no different. Yes, many people have been evacuated from the Fukushima area. This is a precaution. As far as I am aware at the time of writing this, NO ONE has been evacuated from Tokyo. Some people have chosen to leave Tokyo for one reason or another. I would guess that the main reason for this is power conservation and scheduled rolling blackouts, which means it is difficult for business to carry on as usual. Some foreign offices have urged their country’s people to leave Tokyo/Japan. This is also just a precaution and, I suspect, a largely unnecessary one. Finally, please remember that Japan is far far more than just Tokyo! I won’t deny that things in Tokyo are not exactly normal right now, but it’s far from the crisis zone that some media will have you believe – I have this from the mouths of people living there right now. So, please, think when you are reading/watching the news. And think before reposting things on Twitter or Facebook. Thank you for this. I am in Tokyo right now, arrived just after the quake happened. Got stuck at Haneda Airport for the night. Too expensive to try and fly out before my scheduled flight. Those reports are not helping people here. They are making it worse plus scaring the family and friends. It is irresponsible of the media to do that. You are right, a lot of sniffles and sneezing here in Tokyo. That is why the masks. Hi there – thanks for stopping by! Well, right now Hamamatsu seems fine! In fact, most of Shizuoka Prefecture seems fine (just some scheduled blackouts in the east). Of course, I’m no fortune teller, but I can’t see things getting that bad here. Right now I would say it’s perfectly safe to come here! 🙂 Good luck with your internship and enjoy Japan when you get here! Here’s hoping to better times! I leave for Japan on the 29th (unless things take a major turn for the worse, which I don’t think will happen) and everyone here thinks I’m crazy. No matter how many times I show them that Hiroshima (my destination) is far from Fukushima, it doesn’t work. Thank you for this post. I googled “how can the japanese go about daily life,” and your post came up. It is good to hear your first-person account, rather that the frenzy-whipping media headlines. It is a necessary reality check. It would be helpful if your calm and rational perspective were shared with everyone! Then we might all worry a little less about the Japanese! It is only through calm and steady action that normalcy can resume in an otherwise calamitous situation. « It’s nothing to do with the earthquake!